Earlier this week, Metro announced plans for new infrastructure to speed up its Orange Line Bus Rapid Transit. The agency is proposing a mile-long bridge that would extend from Van Nuys Boulevard to Sepulveda Boulevard. The project would also add rail-type crossing gates at 34 intersections. The bridge, combined with the gated crossings is estimated to cost $283 million, and result in a 16-minute time savings for buses traversing the line. 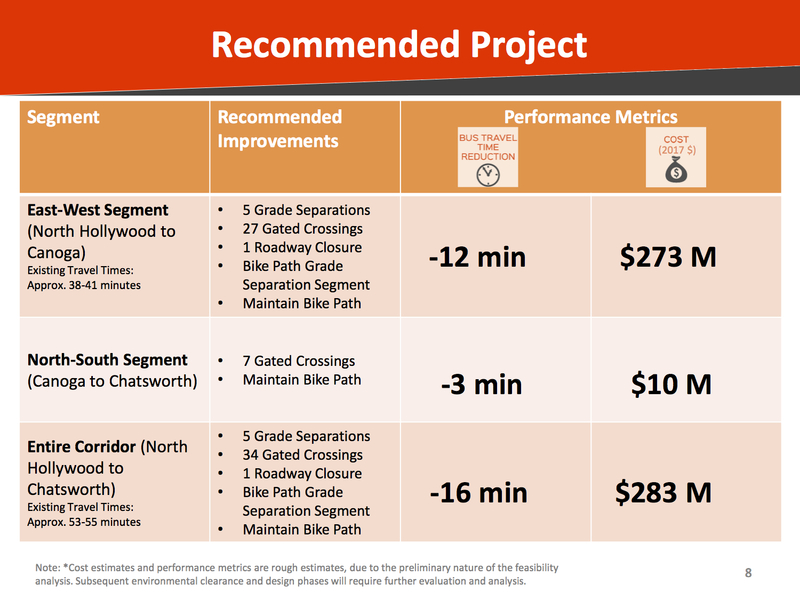 Funding for Orange Line grade separation is included among the early projects in Measure M. Metro reports that, after environmental clearance just getting underway, the project is expected to be built by 2025. There is further Measure M funding to convert the Orange Line BRT to rail, though that is not scheduled until the 2050s. At this point, not a lot of details have been made public. The Source shares two slides from a not-yet-released slideshow summarizing a not-yet-released report. Streetsblog, Urbanize and The Daily News all cribbed from those two slides. On the face of it, the project sounds great. Faster buses will improve the quality of life for 30,000 daily riders. Focusing on the mile-long bridge lays groundwork for eventual conversion to rail. Doing that for about $300 million is cheap compared to most Metro highway and transit projects. The angels may be in the details of what happens underneath that bridge – and what is prioritized there. The under-bridge space could be designed in a way that prioritizes cars. Metro, working with LADOT, could choose to add parking lots, to add access roads, and/or to prioritize automobile cross-traffic at intersections. Getting the buses off the ground could free up the ground for more cars. Alternately, the space could prioritize walking and bicycling. Today, the Orange Line includes a parallel walk and bike path. The path is preserved in Metro’s elevated BRT plan. Though the path is well-used by cyclists, runners, dog-walkers and other pedestrians, it also (like much of L.A. these days) experiences issues with homelessness. The path is currently easily accessed to/from the north, but not the south. With the busway removed from the ground level, there are possibilities for opening up more and better connections for walking and biking. 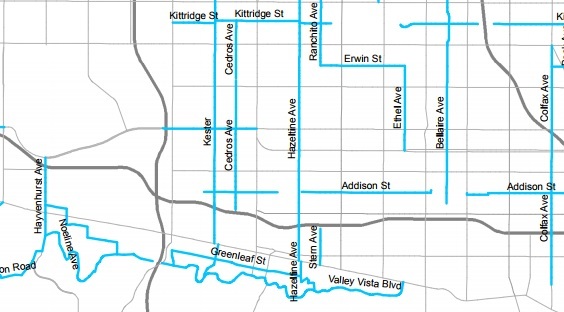 These would foster first/last mile connections for both the Orange Line and the future East San Fernando Valley transit project along Van Nuys. Metro’s plan includes a street closure at Tyrone Avenue, just east of Van Nuys Blvd, presumably where a bridge would be ramping up. Closing the street to cars, but keeping bicycle and pedestrian access could effectively create a bicycle boulevard. Another potential walk/bike crossing point would be Cedros Avenue. 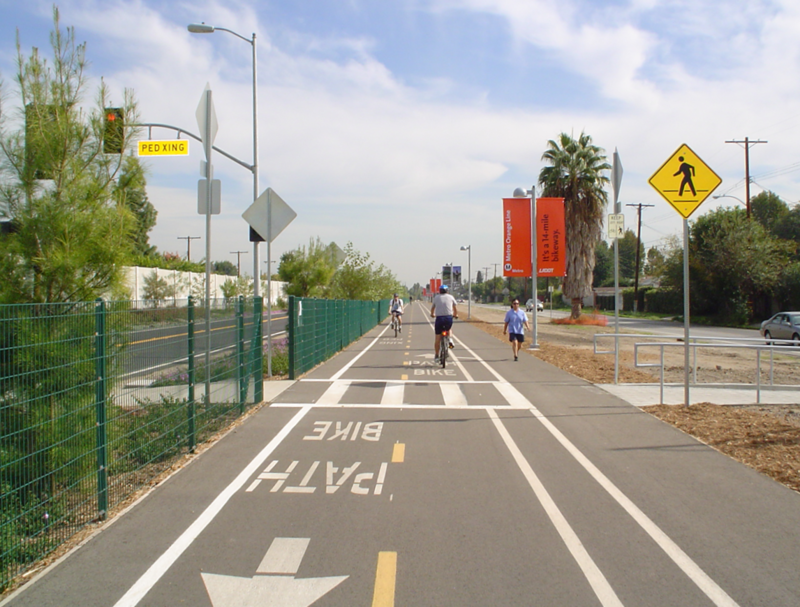 The Orange Line busway is currently an obstacle in the way of implementing L.A. City’s Mobility Plan 2035, which designated Cedros as a Neighborhood Network low-stress street where bicycles can comfortably share streets with cars. With the busway elevated, Cedros can be connected for cyclists and pedestrians. Overall, spaces beneath large infrastructure, think freeways, can become nuisance-plagued no-man’s lands. The space below an elevated busway (running electric buses by then) is not so ruined with air and noise pollution as space under a highway. Activating that space should be part of the overall design, not an afterthought. If Metro does not activate the space, homelessness and crime likely will. Features below the busway should not be so expensive as to break Metro’s budget or delay the project, but, as with Metro’s commitment to Transit-Oriented Communities, Metro can be a partner for projects that serve the community. It is not up to a Streetsblog author to designate what the space should be used for; that should be part of Metro’s community input process about to get underway. The corridor is already essentially a landscaped linear park, so a few relatively low-cost complementary features could include: basketball courts, a Metro bike hub (possibly including bike rental and/or bike-share), tot-lots, a skate park, community gardens, or modest scale park-serving retail such as a cafe (or spaces for street vending and/or food trucks). Thinking bigger, this is a Metro-owned right-of-way, so it could even be a potential site for some medium-scale transit-oriented housing. Adding ground-level features will not necessarily be easy, but doing it up front should facilitate first/last mile transportation, minimize future nuisances, and build community. Readers – what do you think of Metro’s plans to elevate a mile of the Orange Line busway? What do you think should go underneath the elevated busway? Get Metro to do something positive for active transportation on a project that isn’t specifically an active transpo project? Hah! Don’t make me laugh. They’d rather preserve car storage along Van Nuys Boulevard than implement bicycle infrastructure. Why does Metro hate walking and biking? How do they not realize they should take every opportunity to make conditions safer and better for bikes/peds to help their ridership? The area could be used for the maintenance yard for the future east San Fernando Valley Transit Project (currently an option for the area north of this new bridge) and even more future Orange Line LRT maintenance yard. Metro’s narrowest maintenance yard is the Chinatown yard, which is 4 times wider than this proposed site and doesnt have supports for a bridge running the entire length. The industrial land around Van Nuys Metrolink will be more than sufficient for a rail yard and storage facility, and it’s lower cost means the ESFV corridor can include more bells and whistles. They would still need additional property on either side of the current right away but not as much. This location for a maintenance yard is ideal for servicing multiple planned LRT systems at one location saving money on building multiple service yards. I can’t see how the VAN Nuys Metrolink station location would be any cheaper. To start with the East San Fernando Transit Line is in a deep tunnel at that location and would need a sufficient amount of additional right away just to get out of the tunnel. From what I understand, Metro’s first choice (at this time) is the area north of the Orange Line, west of Van Nuys, This would just shift the facility footprint south block. Is it only in Streetsblog posts that I see “parking” referred to as “car storage”? Outside of these websites, “car storage” usually refers to places in industrial areas where “project cars” and RVs are stored. Also, with regards to the LA Metro staff, some years ago a transit advocate determined that of all the Metro employees, only about 5% use the “sponsor’s product”, and most, if not all of them, get transit passes as a “fringe benefit”. So it’s no wonder that “active transportation” doesn’t get much attention. Yesterday, the Metro board approved numerous items, including advancing Measure R funding to get the Purple Line Subway to Westwood completed ahead of schedule.